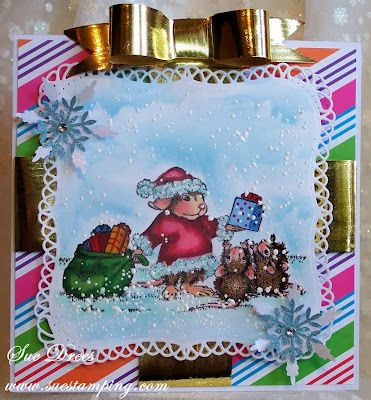 It's new challenge day at House Mouse and Friends Monday Challenge. But before we get to the challenge, we would like to thank everyone who played in our last challenge, and congratulations to the winners. Also, today, we are announcing our four new additions to the design team. The four new folks were picked from our guest designers during the year and voted on by the entire design team. A big welcome to our four newest design team members! So excited to have you joining our House Mouse DT Family. 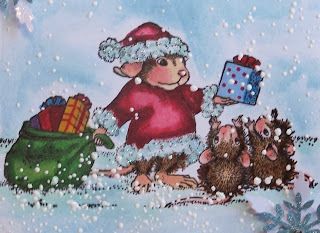 The words to the song are printed on the House Mouse blog site. I chose: "Snowflakes that Stay on my nose and eyelashes"
The challenge runs through November 30th at midnight EST. We hope you will join us for our MY FAVORITE THINGS Challenge. We love visiting you to see what you come up with. Sue, first off thank you so very much for the warm welcome and the help you have given me thus far (I'm sure there will be more needed) LOL. Your card is so delightful and festive. It looks like a precious package. I have to get some of that Fran-tage. It looks so real falling down on such an adorable cast of characters. Just a darling card. Your Frantage looks fabulous. I bought some, but I tend to be too heavy with it. Yours is lightly applied and perfect. PS: You are right it is definitely an Awww. fantastic and gorgeous card Sue. Definitely an Awwww card Sue! That image is so cute and your colouring is wonderful. I love the papers and gorgeous gold bow too. This is a gorgeous card Sue, lovely bright papers and your fabulous snowy image is adorable. Thank you for making me feel so welcome at House-Mouse & Friends Monday, I'm so excited to be on the team. A gorgeous image Sue - I just love this sweet image - fabulous colouring and such stunning stripey papers!! OH WOW!! Sue this is just GORGEOUS!! I have a ton of House of Mouse in the basement...think I'd like to play along!!! Thanks for the wonderful inspiration!!! What a pretty card, love your papers and image. awww, yes! Definitely! What a seriously CUTE image, and so perfectly colored! I just love that big gold bow too! GJ! Adorable and sweet and gorgeous in its detailing and special cuts. FAB House-Mouse Christmas card.